A couple weeks ago, I praised Cleveland Browns owner Jimmy Haslam for finally getting out of the way and letting his key-decision makers build this team unimpeded. Further reason to celebrate Haslam backing off can be found within this morning’s intensely detailed column from ESPN’s Seth Wickersham. If you haven’t read it yet, I’d encourage you to do so as soon as you can. In it, Wickersham goes to great lengths highlighting how Haslam played the biggest role in turning the Browns into an unending disaster ever since he bought the team in 2012. To me, while getting a deeper look into the chaos which plagued this team over the past few years was interesting, I couldn’t help but think about how it affects the future. If I took anything away from Wickersham’s column, it was the realization of just how tenuous Cleveland’s sudden uprising truly is. This isn’t the first time we’ve heard about Haslam’s missteps as the owner of the Browns. To be honest, very little in this column should come as a surprise to anyone who’s followed this team over the past few years. We always knew Haslam’s structure was a mess, and always knew his impatience eventually destroyed every plan the front office laid out for success. However, when you think about this and add in the new context of the Browns suddenly turning the corner on the field, it makes things a little different. For all intents and purposes, Cleveland appears to be ready to put years of dysfunction in the past. GM John Dorsey has assembled a roster which appears ready to contend, thanks in part to the sudden rise of quarterback Baker Mayfield. Fans can finally dream big for the years ahead, and can do so without a hint of sarcasm for once. Yet, as you read Wickersham’s post, how can you not get a little anxious? How can you hear more detail about Haslam’s ever-present urge to interfere and not worry about him eventually messing with a good thing? Sure, it seems as though he’s learned the error of his ways this time around. He let Dorsey manage both the draft and the recent coaching search, and is allowing new head coach Freddie Kitchens to work directly under the GM as opposed to having everyone report to the owner. As you can see, a clear plan appears to be in place with the Browns. That said, while sticking with a plan is the key for their success, the problem has always been Haslam’s inability to actually do this. Wickersham notes several instances where Cleveland’s previous front offices aligned on set proposals which, on the surface, appeared to be the best route to take in getting this team out of the mud. Every attempt ended with Haslam scrapping the plan and firing all who were involved with developing it, often a couple years before success was supposed to start developing. Which is why my immediate reaction to Wickersham’s piece was realizing just how shaky this all is. How the Browns may appear to be going in the right direction, but also how one false step could send the team careening back off the tracks. If Kitchens gets his head coaching career off to a rocky start, will Haslam feel the urge to get more involved? If Mayfield gets hurt and the team suffers as a result, will the results on the field cloud Haslam’s judgement? In general, will things have to be constantly trending in the right direction in order to ensure he won’t interfere? I can’t read this morning’s column and confidently say “no” to any of those questions. While Haslam has indeed pulled back this time around, there’s no proof he’d be able to maintain this if next season’s results don’t meet the suddenly-elevated expectations. To clarify, this shouldn’t be seen as some sort of foreboding preview for the year ahead. Brighter days truly appear to be on the horizon for the Browns. That said, we now have a better idea of just how quickly this hope could be snuffed out. All it could take is one bad call from Haslam, one instance of ignoring the advice of his staff, and things could suddenly crumble once again, erasing all the established momentum and sending the team careening back to square one. 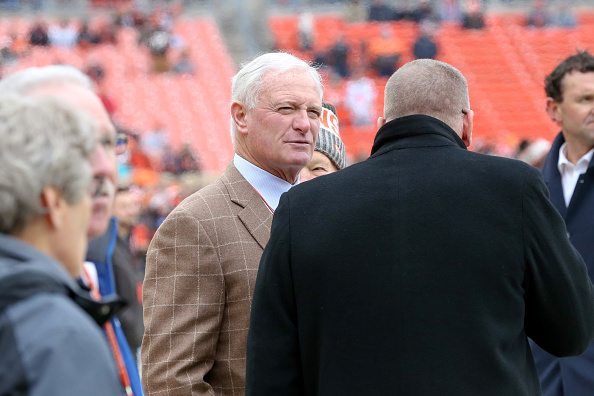 The Browns may be inching towards success, but under Haslam’s watch, it seems they’ll always be doing so on a tightrope.